Qualcomm on Monday introduced its first virtual reality software development kit, designed for its Snapdragon 820 mobile SoC. The new tools will enable software makers to create programs that take advantage of Snapdragon 820’s graphics processing capabilities (i.e. Adreno) as well as built-in sensors. Qualcomm confirmed that in addition to smartphones and other mobile devices, the Snapdragon 820 will also be used inside VR headsets. The Samsung Gear VR platform, as well as Google’s Cardboard, have demonstrated that smartphones based on contemporary high-end mobile SoCs can be used to enable virtual reality headsets. 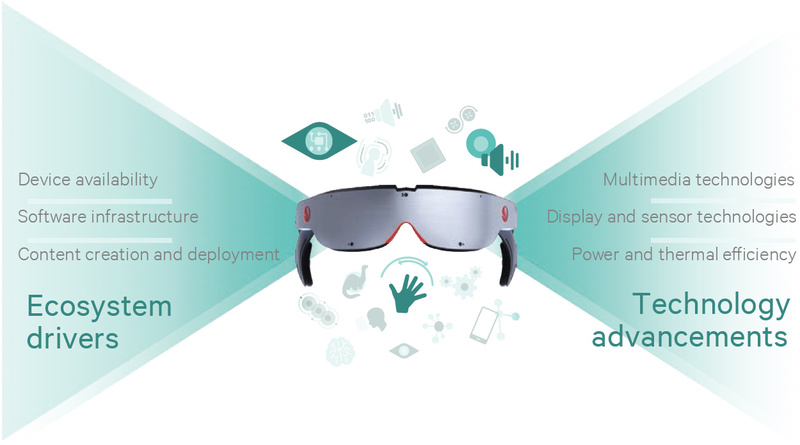 While graphics processing performance of mobile SoCs lags behind modern desktop graphics by AMD or NVIDIA, they integrate numerous sensors and technologies which can crucial for virtual reality equipment. In fact, positive virtual reality experience requires not only high-quality visuals and surround sound but also the complete immersion of the user and a sense of physical presence. As a result, precise sensors to track user’s movements and minimal latency are very important. But to fully utilize capabilities of modern mobile SoCs, software developers need a right set of tools tailored for VR software. Also, given the secrecy around the internal GPU Adreno graphics solution and its microarchitecture, any set of tools that can assist with graphics/DSP manipulation are a good thing to have. Qualcomm’s Snapdragon VR SDK, which will be available in the second quarter, supports a number of technologies that simplify development of virtual reality applications, such as games, 360° VR videos and a variety of interactive education and entertainment apps. The Snapdragon VR SDK supports DSP sensor fusion, which allows developers to access high-frequency inertial data from gyroscopes and accelerometers via the Snapdragon Sensor Core. The software development kit also allows developers to use the Qualcomm Hexagon DSP for predictive head position processing. Usage of the Snapdragon VR SDK reduces latency by up to 50% by using asynchronous time warp with single buffer rendering for a rapid transformation of rendered images in 3D space. Qualcomm says that its Snapdragon 820 SoC features 18 ms motion to photon latency thanks to various enhancements. The Snapdragon VR SDK also brings support for stereoscopic rendering with lens correction, color correction and barrel distortion, something that should improve the visual quality of graphics and videos. According to Qualcomm, the Snapdragon 820 can render stereoscopic images in 3200x1800 resolution at 90 fps. In addition, the software development kit can help to generate menus that are readable in VR worlds thanks to UI layering. Finally, the Snapdragon VR SDK gives developers access to CPU, GPU, and DSP power and performance management in a bid to help them guarantee high and stable frame rates (90 fps) in low-power devices. Precise power management is also required to build sleek and lightweight VR headsets. 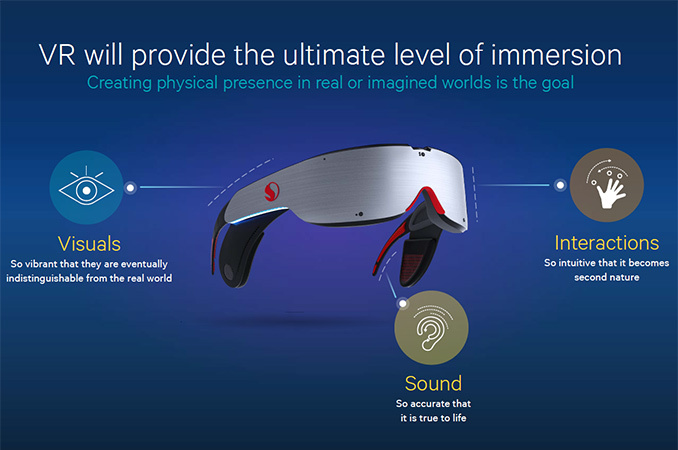 While the launch of a special Snapdragon VR SDK is a significant step for Qualcomm in the field of virtual reality, what is really important is Qualcomm’s commitment to VR in general. The company claims that it developed the Snapdragon 820 with virtual reality in mind and it will continue to implement VR-specific technologies into its upcoming Adreno graphics cores, CPU cores as well as Hexagon DSPs. Keeping in mind that VR headsets will only get more complex in the coming years, all the technologies that Qualcomm manages to incorporate into its SoCs will be instrumental in improving the quality of VR content. For ecosystem enablement, Qualcomm will initially bring developers this VR SDK, and then also app development tools, device optimization tools, development platforms, and so on. In particular, Qualcomm claims that VR headsets based on the Snapdragon 820 are incoming, which will allow end-users to experience VR apps and content, whereas developers will be able to test their programs on commercial hardware. So I have a S7 Edge and I got the GearVR free with it, and I don't think it's good enough. The resolution is sorely lacking. You can see the pixel grid, its like playing games on an old CRT tube at 1024x768, and watching video is like going back to a standard def TV. At first I thought it was just the focus, as the phone is 2560x1440, but then I realized that the area you see in front of you is only a section of that. So while the Netflix app is pretty cool, you are sitting in this mountain home with a giant 100 inch TV in front of you, the video quality is very poor. Making taking off the VR and just looking at the phone a superior viewing option. The problem with pushing the pixel density is it heavily affects frame-rates. It needs to be at least 90 FPS to keep you from getting sick, and really 120 FPS is the bare minimum for a fluid experience. 240 FPS is where it has to get for it to be imperceivable to the human brain. CPU and GPU memory sharing already happens - the GPU can use system memory if it runs out of fast onboard memory. Doing something like HSA makes no sense with discrete graphics cards because there are two separate pools of memory (main memory capable of 20-30 GB/s on most consumer platforms, video memory capable of 200-300 GB/s on mid/high end video cards) connected by a slow ~15-16 GB/s 16x PCIe 3.0 link. It only makes sense if you are using integrated graphics. I'm know I've said this several times, and perhaps you just don't care, but there's really not a lot of SECRETS with adreno. There's a well supported open source driver that supports up to the adreno 430 (I think they've only got the DRM side working for adreno 530, but that's the kernel side of interest, anyway). The architecture is all there if you care enough to look at the code. You could also go on irc and talk to the developers (Qualcomm via quic also contribute) to get answers to specific questions. The main developer is a helluva nice person.